Directions (Q. 1 – 5) Study the following information carefully and answer the given questions. 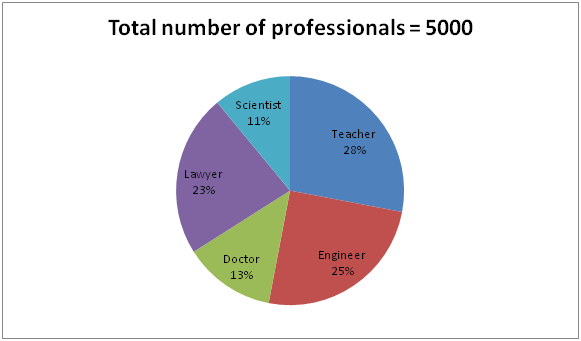 The following pie chart shows the percentage distribution of total number of different professionals in a certain city. 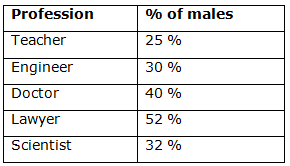 The table shows the percentage of male professionals among them. 1. Total number of female teachers is approximately what percentage of total number of male doctors in a city? 2. Find the ratio between the total number of male engineers to that of total number of female lawyers in a city? 3. Find the difference between the total number of teachers to that of scientist in a city? 4. Find the total number of female engineer, doctor and lawyer in a city? 5. Total number of female scientists is approximately what percentage more/less than the total number of male doctors in a city? Directions (Q. 6 – 10) what approximate value should come in place of question mark (?) in the following questions? 9. 713.41 – 263.78 ÷ (21.78 % of 201) =? 713.41 – 263.78 ÷ (21.78 % of 201) =? Directions (Q. 1 – 5) Study the following information carefully and answer the given questions. The following pie chart shows the percentage distribution of total number of different professionals in a certain city. The table shows the percentage of male professionals among them. 1) Total number of female teachers is approximately what percentage of total number of male doctors in a city? 2) Find the ratio between the total number of male engineers to that of total number of female lawyers in a city? 3) Find the difference between the total number of teachers to that of scientist in a city? 4) Find the total number of female engineer, doctor and lawyer in a city? 5) Total number of female scientists is approximately what percentage more/less than the total number of male doctors in a city? 9) 713.41 – 263.78 ÷ (21.78 % of 201) =?